Most of us cook the same few dishes over and over again because we′re busy and have lost our connection to the changes of the seasons. The Food Clock showcases food that is simple to prepare and makes the most of fresh, seasonal ingredients. Join me on a culinary journey through a year in the life of my fictional alter-ego Monsieur Henri Petit-Pois, a French country gentleman of the early 20th century, who loves nothing more than pottering around his home and ample garden. This is an unusual book that blends a whimsical novel with beautiful and enchanting food, featuring extraordinary styling by designer Matt Page. For those who love food, and those who love stories, I know you’ll find so much to adore about The Food Clock. 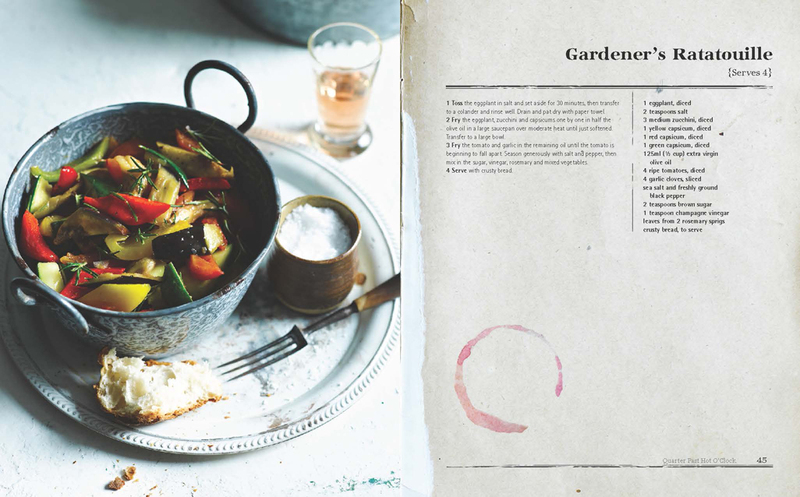 From family favourite mains like flame-grilled porterhouse with herb-roasted tomatoes, and ham and broad bean risotto, to desserts such as cherry pie, and steamed mandarin pudding with burnt honey sauce, The Food Clock will revolutionise your kitchen and is a book to be savoured all year round.